You didn't think you'd seen the last of the double-decker cookie, did you?!? Oh no...I sense a double-decker cookie obsession coming on. As soon as I started thinking about St. Patrick's Day, I wanted to do a shamrock version of the hearts...but I couldn't decide on a background. Then, out-of-the-blue, it came to me....rainbow! Do you know I've NEVER made a rainbow cookie before?!? Never! How is that possible? 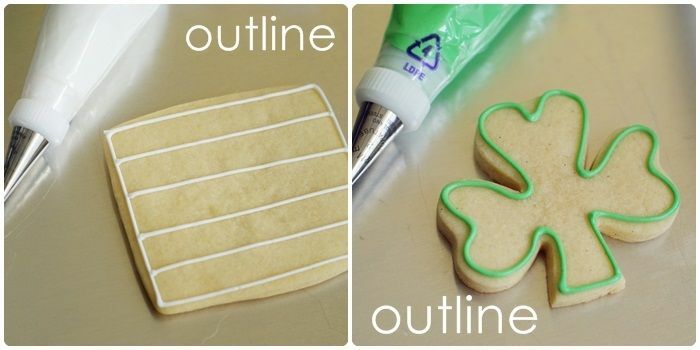 Outline the cookies with a #2 tip. Use green for the shamrock and white for the rectangle. Pipe stripes across the rectangle. Go ahead and save some of this piping consistency green or white icing....it doesn't matter which one. You won't need it until the next day; this will be your "glue" to attach the cookies together. You can just plop the icing bag right in your fridge. Thin all of the icings (except white) with water, a little at a time, stirring gently with a rubber spatula, until it is the consistency of a thick syrup. (Here is a video I made a few years ago showing how I do it.) Cover with a damp dish towel and let sit for several minutes. Stir gently with a rubber spatula to pop any air bubbles that might have formed. Pour into squeeze bottles as needed. 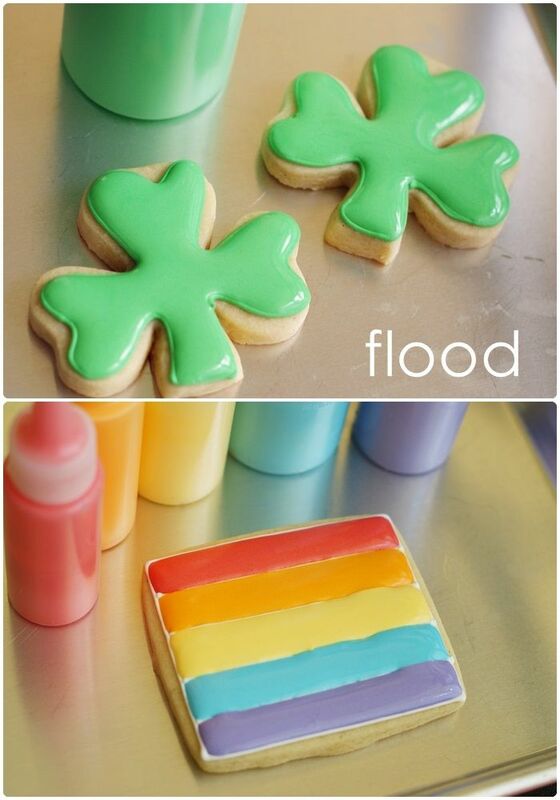 Fill the shamrocks with the green flood icing, using a toothpick to guide to edges and pop large air bubbles. Fill in the rainbow with the other colors....remember Roy G. Biv? Follow that, but I just skipped green since we have the shamrock, and indigo, because, well, I just did. ...don't overfill the area. 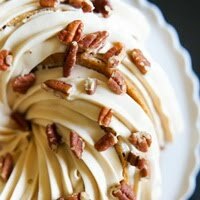 Use just as much icing as you need to cover the area well, but you don't want a mound of icing. ...run a toothpick all the way through the icing (I use an 8-pattern), even if your icing has already spread across the area to me filled. The next day, take the reserved icing out of the fridge to warm up a bit. 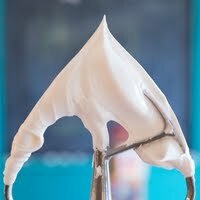 Combine 1/4 teaspoon water with 1/4 teaspoon of meringue powder. 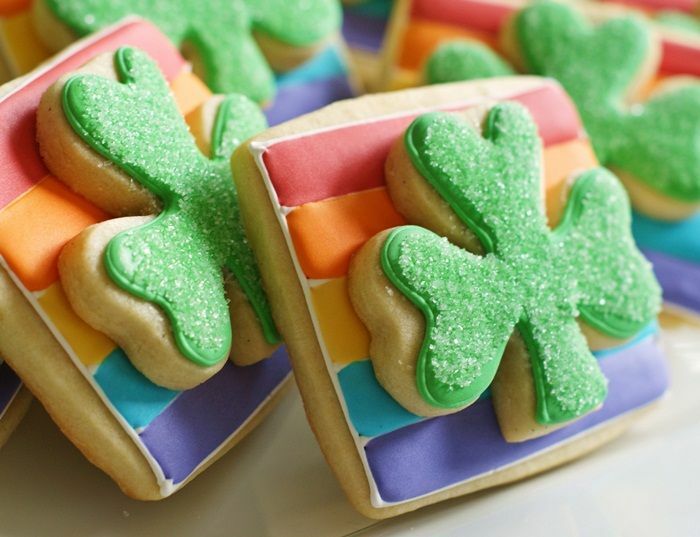 Brush with mixture onto the shamrock cookies with a small paintbrush. Sprinkle on the sanding sugar and shake off the excess. Pipe a small amount of icing onto the back of the shamrock. 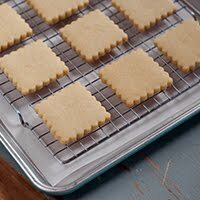 Press onto the rectangle cookie to adhere. Let the cookies dry about 30 minutes before packaging. Those are so cute! I love the rainbow on the bottom cookie! Love these. Thanks for giving us all the tips and the tutorial. And for telling us the color names you used. Aww, they're so cute. They really make me happy just looking at them. These are so cute, love them! Double decker cookies are so great!! Perfect for sharing with a friend! I love that you outlined in white. The idea of a rainbow cookie stresses me out because I need to outline, but didn't know what color to use. And I use a different medium for my outline and flooding, so that's possibly 12 different color mixings happening. From now on I will just remember white! Thanks Bridget!! how in the world do you stay so little??? little....HAHA! That is the biggest laugh I've had all day, Kellie! ;) Thank you! These are so freaking pretty!! Love it! Beautiful!! Love them through and through! For your first rainbow cookie, you've created a doozy! Your double decker cookies are amazing! Happy St. Patrick's Day! I love the rainbow behind the shamrock. Oh wow--I am so impressed with your site!! What darling cookies for st Pattys. I love them!! I would like to see rainbow cookies! :) love. Oh wow these are stunning! I hope you're selling these somewhere because if not you're missing out on some mucho dinero. Shoot, wrong holiday. I cannot believe this is your first rainbow, so cute. Oh my gosh! These are just so adorable! I love these, Bridget! Well then, happy st.patricks day. I SO have to stop reading, it's 3.30 a.m. in germany right now, but I so so so so so so can't. you have the most AMAZING blog, I love it. I never actually decorated a single cookie in my life (although I tried a cake once...) but I feel like I have to start RIGHT NOW and never ever stop. I'm frantically searching in my head to find an appropriate cookie-design to make back-to-university-cookies in april, any ideas? The are picture perfect...as in, they look like they should be in a magazine!! Gorgeous! They are SO pretty!! And I love the sanding sugar on the shamrock! Perfect detail! Bridget, these are so inventive. 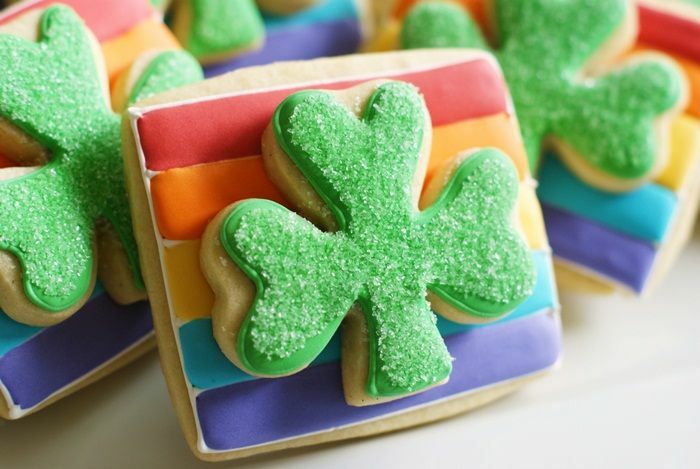 What perfect cookies for any little leprechauns. I too love the double~decker! 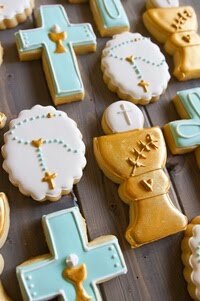 I can only imagine how HEAVENLY it is to put your entire mouth around 2 layers of cookie and icing! The rainbow is perfection behind that shiney~sparkly shamrock! 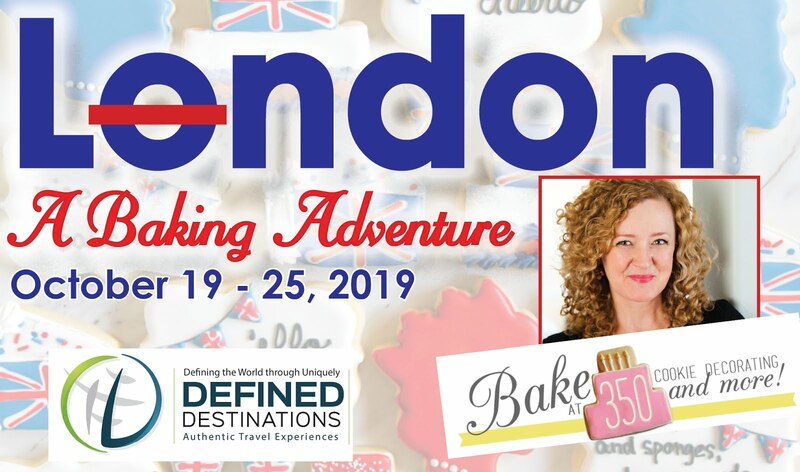 I think your next book needs to be all DOUBLE~DECKER Bake at 350 cookies! Cookies in 3D??? Love the double decker idea! So pretty Bridget :) Happy St. Patty's Day! Very lovely! I too keep having cave-ins in narrow areas. I searched the web and it seems to be a common problem with no solution. Thanks for the suggestions, I will try this next time. As this one is really looking one of rocking featured source for me. 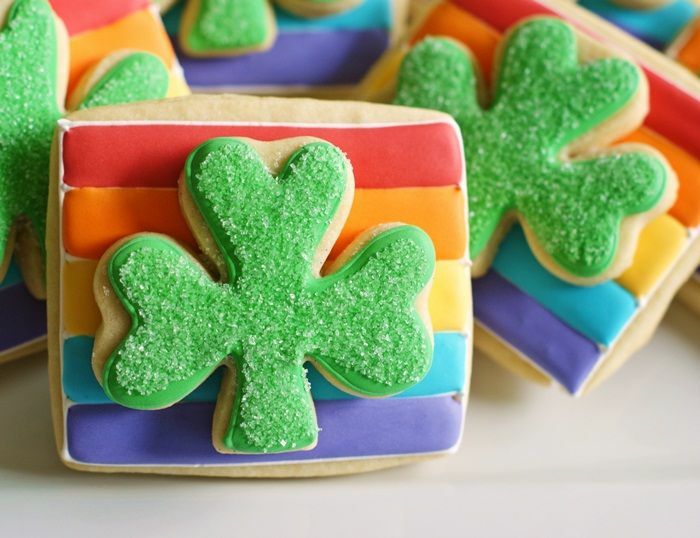 As I have found Double-decker Rainbow Shamrock Cookies from this source. As the post shows exceptional way to make this one. 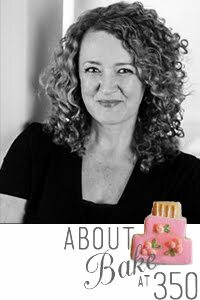 Thanks for sharing some of most promising features about to make this delicious cakes. Thanks for sharing. Ha ha, Shawna, I was thinking the same thing! These are just adorable!! 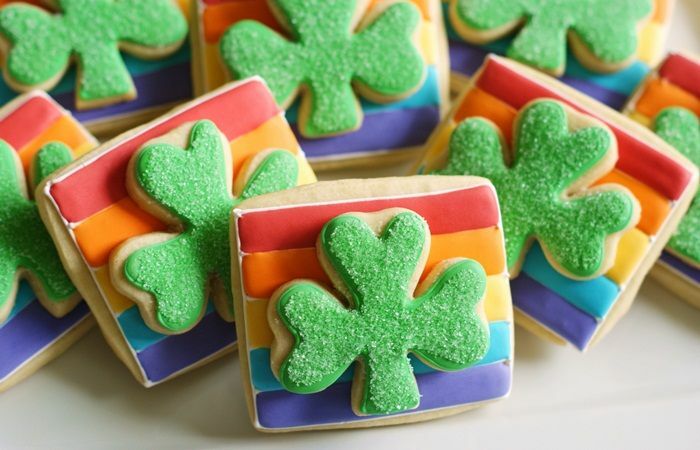 Love the sugar on the shamrock! ...and may nothing but happiness come through your door too Bridget. Happy St. Patrick's Day. 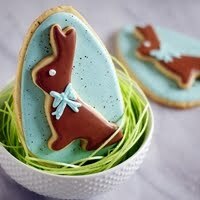 You certainly made a lovely cookie (s) to celebrate! Wow, love these, Bridget. Happy St. Patrick's day to you and your family! I am seeing double rainbows! 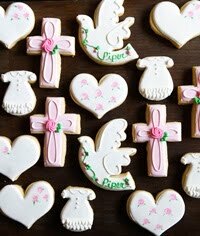 Love it, those cookies are adorable. CUTE!!!!! 2 cookies in 1 just means I only have to say I'm eating 1, but I'm actually getting 2, right? A twofer, score! I love all the posts the St. Patrick's day posts this week. All are fantastic! You really did a beautiful job with these! I bet whoever had the pleasure of consuming them was very impressed by your craftswomanship ;) Hope you enjoyed your St. Paddy's! What a way to celebrate St. Patty's Day! Less calories because it's only 1 cookie, right?! ;) These are really beautiful! Oh my gosh - so adorable! These were so festive and delicious! TY! I love your double decker cookies! Keep 'em coming! I just loved the pic. so I set it as my phone background. Just a comment from The Netherlands. Love your blog;].